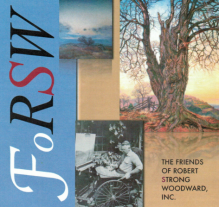 RSW- Artwork page, "White Winter"
See also A Winter Afternoon, to view a related piece. "Painted prior to 1930. 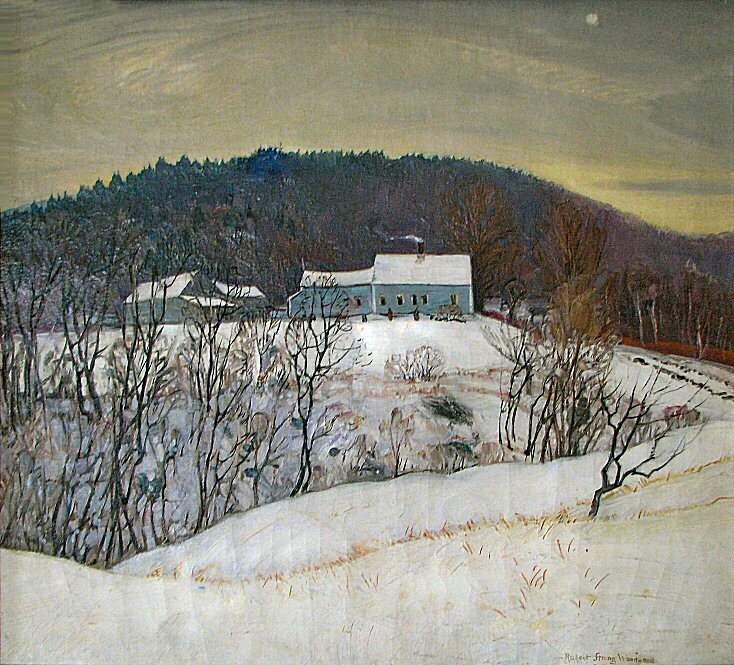 One of my most impressive full winter canvases, loved and admired by all, but strangely up to 1947 never sold. 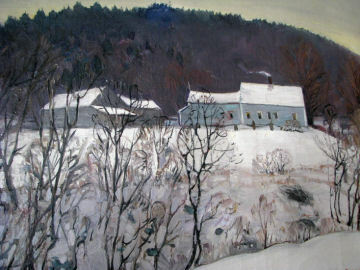 The Nilman farm (small gray farm house with barns) on a wintry knoll backed by a dark forested mountain range in rich purple as painted on a cloudy winter day, the pale sunspot just showing over the hill through yellow-gray, tawny clouds, white and violet and purple and yellow in the painting with no 'white and blue' as in most winter canvases. Painted fairly early in my career when I was apt to use too much varnish so the foreground of the picture has a few inconspicuous cracks in it, though not deeply affecting the beauty or looks of the canvas. Sold to Earl Griswold. Sept,. 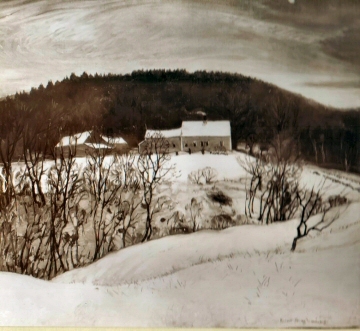 1957"
"A subtle winter canvas, not as dark as this photograph indicates. Gray and pale yellow sky. Sun spot showing through. Mountain dark violet. House gray. Violet shadows on bank. Yellow grasses in foreground." "Another admirable snow painting, severely simple in its treatment is White Winter, with its empurpled tawny woods in the background." 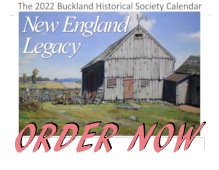 "And surely all the pastoral beauty of the New England Winter is in White Winter with that cluster of farm houses in the centre and the snow-covered, rolling country leading up to the hill and sky. That is a powerful bit of painting."